Dr. Syed Imran Ali, Global Health & Humanitarianism Research Fellow, presents findings from research with Médecins Sans Frontières (MSF) on disinfection by-products in emergency safe water supplies at the 8th Emergency Environmental Health Forum in Berlin, Germany. Chlorination is one of the most widespread methods for treating water and ensuring it is safe to drink in humanitarian crises globally. Given the reliance on chlorination in the sector, concerns have arisen about disinfection by-products (DBPs), such as trihalomethanes, which may be carcinogenic or lead to other adverse outcomes such as reproductive system effects. This study, undertaken at MSF’s surface water treatment plant in northern Uganda, is the first to investigate DBP production in emergency water supply. 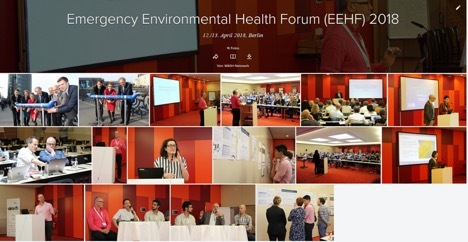 DIGHR Fellow Dr. Syed Imran Ali conducted this research in Uganda in collaboration with MSF and recently travelled to the 8th annual inter-agency Emergency Environmental Health Forum, held in Berlin on April 12-13, 2018, to share the findings with the wider humanitarian community. A poster summarizing the findings of the research is given below. For more on this project, please contact Dr. Syed Imran Ali, DIGHR Fellow in Global Health and Humanitarianism, at siali@yorku.ca.